Choosing a gaming keyboard is something personal. The best for one person could be Cherry Browns or the Razer Greens with a RGB glow. Gigantic wrist pads, compact shapes, numeric keypads, macro keys, volume controls. Just a ton of keyboards exist because everyone wants a different mix of features. To help you choosing from all of these options, we’ve come up with our top recommendations. All of these focus on mechanical keyboards, because they’re simply more comfortable to use over the long term. But if we encounter an alternative that works well, you will see it on this list. Not too long time ago, the CM Storm QuickFire TK was the recommended sub- mechanical keyboard. It was using genuine Cherry MX switches. The market for budget-friendly mechanical keyboards has expanded quite a bit. Nowadays, The new Razer new BlackWidow X Tournament Edition is the must go, as long as you don’t need backlighting. It lists for only RM 499.00 and has the same metal-backplate design of the larger BlackWidow X. Oh, and the keys itself are fully programmable. If you’re willing to go right up to RM 489.00, the Kingston HyperX Alloy FPS offers some nice things. It comes with backlighting, features Cherry MX keys, and is the slimmest keyboard on the market. Also the Mini USB cable is detachable. Special feature of this keyboard is the HyperX red backlit keys with dynamic lighting effects. Additional Colored, textured keycaps for FPS gameplay. The low end of the market is a free-for-all. The Corsair K65, the Razer BlackWidow Ultimate, Ducky Shine 6, the Corsair Strafe—these are all fine keyboards around RM 499.00/649.00 that feature Cherry MX switches and backlighting. The biggest difference is design, which is a personal preference. The HyperX Alloy’s has a minimalist look, but someone else could prefer a bulkier look like the Razer BlackWidow. If you are in love with Logitech’s minimalist G610 design since its release, particularly because you can find it with Cherry mechanical keys, then this will be the keyboard you need to choose if you still are searching for a mid-tier keyboard. The G610 ditches all of the unnecessary extra’s that usually are implemented by other companies in their gaming keyboards. So you’ll find no macro keys, oversized wrist rest, or crazy blue highlights on the G610’s chassis. This is a simple, office- and home-friendly keyboard shaped like a standard black rectangle which works perfectly. The keyboard is a single-color—the G610 glows white—but some higher-end features do make an appearance. In the G610’s case, you get dedicated media keys and a volume roller. The G610’s media keys also have a pleasant stiffness to them when you press upon them. And you will get 2 years of warranty compared to other companies which only give support for one year. The non-RGB Corsair K70 is a favorite, with its sleek metal frame and detachable wrist rest. And Ducky have won fans with their sleek, simple designs—though you’re often paying more for less, in that case. It comes in Cherry Brown, Blue and Red versions,but there is also the LUX version with some extra's. So it is all varying in price. The first RGB-lit mechanical keyboards arrived in 2014 and as a result, there’s a lot of turnover as far as which board holds the top position. For now, the ruler of the bunch is the Razer Deathstalker ultimate gaming keyboard. Razer seems to have “borrowed” quite a bit of “inspiration” from Corsair’s K70 line and Logitech’s G910. It’s evident in the shape and layout, the typeface used on the keycaps. But it’s a damn nice keyboard. Fully programmable slim chiclet keycaps? Check. Switchblade User Interface? Check. 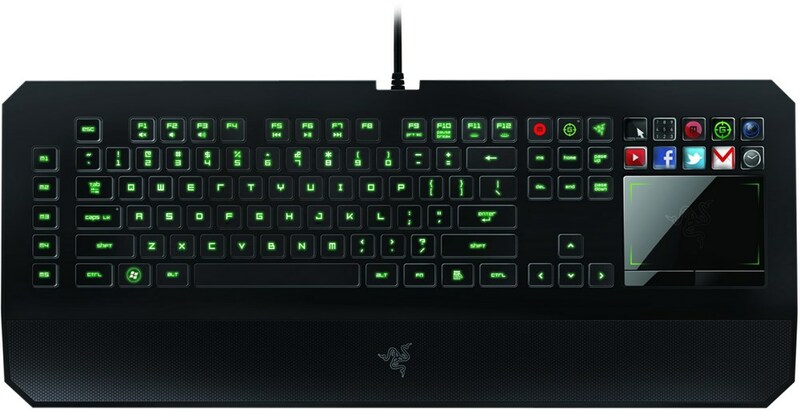 Razer DeathStalker Ultimate’s anti-ghosting? Check. 10 dynamic tactile keys displaying applications? Check. The list goes on: the timeless typeface on each keycap, a beautiful LED volume readout, a mouse cable holder for clean routing. 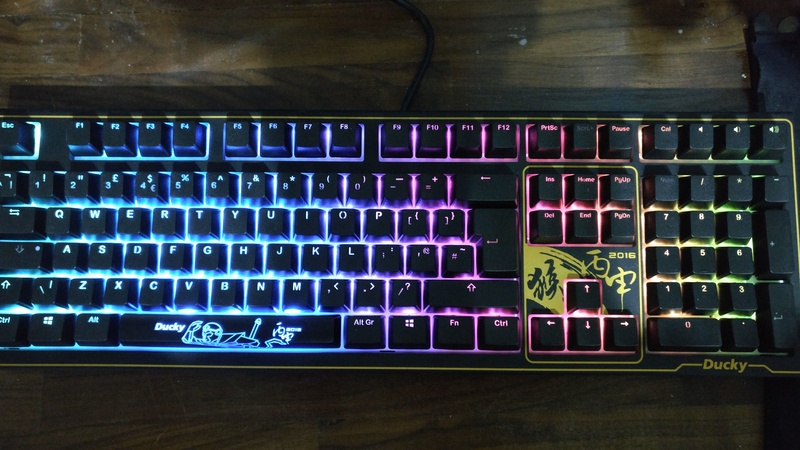 The newcherry 'rgb' mechanical keyboard, is excellent for gaming and typing, this Ducky Year of the Monkey mechanical keyboard features tactile switches for tactile feedback without the noise of a clicky style switch. You also get beautiful backlighting. You get some of the finest RGB backlighing. It’s consistent across the whole key, unlike with Cherry switches. As you may have noticed through the rest of this guide, Cherry’s mechanical MX switches dominate. That’s because they’re reliable, durable, and consistent. You also typically have a fairly decent of options among the four common variants, there’s the tactile and clicky Blues, the tactile but quieter Browns, the heavy linear Blacks, and the light linear Reds. Other switches aren’t disqualified, but few stand out as strongly as Cherry MX switches. If you really require an alternative, Razer’s Green switches are a decent stand-in for Cherry Blues and the SteelSeries QS1 is a good Cherry Red alternative. On the whole, “office-friendly” designs are much more universal than keyboards that offer superfluous features or design elements. Legibility of the typeface on keycaps also factors a major part. Fabric-sheathed cables, macro keys, media keys, N-key rollover, game mode, USB passthrough, audio hub, there are plenty of secondary features that can elevate a keyboard above its competitors. We keep an eye out for which actually work out well in practice.